Some desserts are classics and never get taken off the menu, year after year. Other desserts follow trends, going in and out of style and from being everywhere to nowhere in the blink of an eye. The classics get passed over for trendier desserts with regularity since many diners know that the classic will be good and can’t resist the novelty and the potential of the newer desserts. It is probably for this very reason that I didn’t have tiramisu for years, though it was once one of my very favorite desserts. Once I realized that it had been so long, however, I decided that things needed to change. I made a tiramisu. 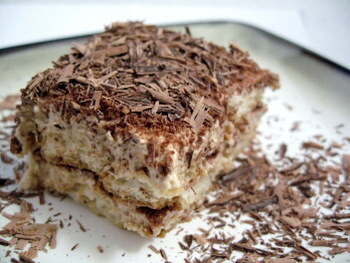 The appeal of tiramisu, for me, is that it is an easy make-ahead dessert. I keep my recipe simple by using a no-cook mascarpone cream and by using store-bought ladyfingers. Mine were from Trader Joe’s, but any quality brand will work well. You’ll need about 30 for this dessert, but since sometimes I’m able to squeeze a couple more into the pan, you might want to make sure you have extras. The dessert should be made the night before you intend to serve it to let the flavors meld together. When finished, the tiramisu has a light and creamy texture that seems to melt right into your mouth. Since the ingredients are rich, it is very filling and can be served in small portions. For this particular batch, I wanted to impart a mocha element, rather than going for a straight coffee one. I did this by adding a generous amound of shaved dark chocolate between the layers and by adding creme de cacao into the coffee dip for an extra chocolate flavor that didn’t change the consistency of the dip. The overall effect is subtle, but delicious. In a large mixing bowl, beat mascarpone, confectioners’ sugar, heavy cream and vanilla until light and fluffy. In a small, shallow bowl, combine coffee, creme de cacao and rum. Quickly dip each ladyfinger into the coffee mixture and place in the bottom of a 8×8-inch baking dish. The bottom layer should have about 15 ladyfingers. Do not soak the ladyfingers in the coffee mixture. When there is a solid layer of ladyfingers, spread half of the cream mixture on top of them. Top with 1 oz dark chocolate shavings. Repeat with remaining ladyfingers, cream mixture and chocolate. Serve with additional chocolate shavings. *Note: You may substitute cream cheese for the mascarpone, or use a combination of both, if you wish. Oh yum thats looks delicious. I love the cocoa addition. I haven’t had tiramisu for ages, but I’m craving it now. 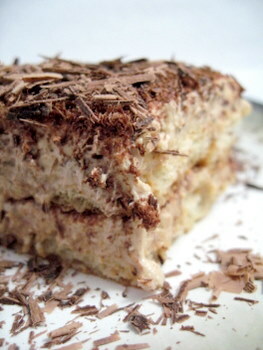 How funny…I was craving tiramisu, too, and made one the day before yesterday. 😉 I made “Aunt Enza’s tiramisu” from Epicurious, and added unsweetened cocoa powder between the layers. Yummy! I think it’s convenient that your recipe uses no raw eggs. A girlfriend of mine is pregnant but LOVES desserts…I’ll have to make her this variety. I think that there are a lot of ways to add a little more chocolate to this if you want to up the mocha flavor. A sprinkle of cocoa powder between the layers (in addition to the chocolate) would be a nice touch! huh- I thought “mocha tiramisu” was redundant. I didn’t realize that chocolate (cocoa) wouldn’t be used standardly. Realizing I haven’t had tiramisu in quite some time now! I’ll have to fix that. I’ve found that a lot of tiramisu recipes just call for a sprinkle of cocoa powder on top, which doesn’t actually carry that much flavor. I’d absolutely love to try this with chocolate ladyfinges for an even more mocha-y dessert, but until I get up the motivation to make some or find some at a store, I’ll stick with this version. I love Tiramisu, but my boyfriend “BIG BEAR” says that it is for wimps (he likes Famous Amos cookies with his Bud). Of course, at 473 pounds he probably doesn’t need the luscious dessert anyway. So, next time he goes to the swamps (he sells alligator eggs that he gathers in the Florida swamp around the trailer park) I am going to try a batch of your mocha tiramisu. Thanks for the idea. By the way, when I lived in Brooklyn I made tiramisu all the time, but it didn’t look as good as yours. Sadly Trader Joe’s ladyfingers are seasonal. I attempted to buy some today and learned that. I will have to find mine elsewhere. I’ll try Whole Food. If they don’t have them I’ll go the mainstream grocery variety but I know TJ’s would be better. 🙂 I don’t think I’ve seen chocolate ladyfingers–I’ll have to check into that as well. My friend that I’m making the dish for is a huge fan of tiramisu so the pressure is on! Definitely my favorite tiramisu recipe. It’s asked for all the time. Today we will be working the locked Alzheimer’s ward, bringing breakfast from the main kitchen downstairs to the smaller kitchen on the ward, serving the residents, cleaning up afterward, and then readying ourselves for their lunch. In fact, time does funny things when there are no little surprises to mark it off into memorable chunks, and I sense that I’m already several years older than I was when I started. Merely wiping the surface with a damp cloth, he said, just spreads the dirt around.